MachineGames, developer of Wolfenstein: The New Order, has said that by building an engine made to scale, the team was able to hit 1080p, 60fps on both the Xbox One and PS4 - which could be key for games having parity across consoles in the future. 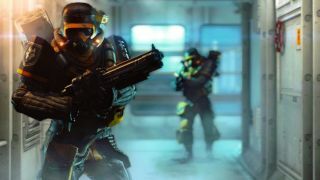 Andreas Ojerfors, senior gameplay designer on The New Order, told TechRadar that developing across the new platforms was actually easier than it was on the last generation. "There was a much bigger difference in making a game for both PS3 and Xbox 360 back in the day than what it is now," he said. "The new platforms are much, much more similar to work with than what we're used to. So it is less of a challenge this time than it has been before." Wolfenstein: The New Order runs at 1080p, 60fps on both the Xbox One and PS4, putting it into a minority of titles that achieve the higher resolution and frame rate on Microsoft's console. Ojerfors told us that this was thanks to the scaling that the id Tech 5 Engine was designed to achieve. "It's about creating an engine that is from the very bottom up built to scale," he said. "I think from the beginning when we got our hands on id Tech, we realised it was an engine that was built to scale very well between different platforms. "And it's been an ongoing effort both among the engineers here at Machine games but also with a great deal of help from id's software to make sure it's an engine that continues to scale on the next generation of platforms."